© AP Photo/John Minchillo Danny OConnor. 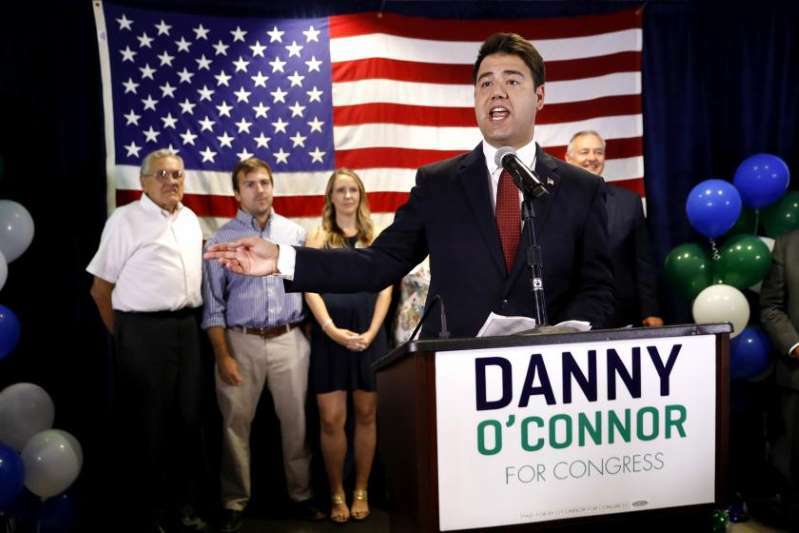 On Tuesday, Democrat Danny O'Connor fought Republican Troy Balderson to what's essentially a draw in a special election for Ohio's 12th congressional district. In 2016, the district went for President Trump by 11 percentage points and elected Rep. Pat Tiberi (R) by 37 points. Balderson will presumably eke out a victory after the 8,500 absentee and provisional ballots are processed. Indeed, he has already claimed victory, and a win is a win. If Democrats continue to outperform by double-digits in November, that "blue wave" will crash over House Republicans. Trump's campaign stop in Ohio, and millions of dollars from national Republicans, may have pushed Balderson over the top, but "with the battlefield expanding to dozens of House districts and a handful of key Senate races, those particular advantages stand to be diluted," the Post says, and the "fundamentals" this year tend to favor the Democrats. Plus, midterms tend to be a referendum on the party in power — and Trump is historically unpopular, CNBC's John Harwood notes. "The 54 percent of Americans who disapprove of his job performance in this week's Gallup poll exceeds the disapproval at a similar point for any of the previous six presidents, beginning with Jimmy Carter. Moreover, Trump has reshaped the GOP in ways that leave the party dependent on greater support from a shrinking segment of the population." If anything, tonight's #OH12 result reinforces our view that Dems are substantial favorites to retake the House in November. "Virtually every Democratic special-election candidate has run on health care and economic fairness — not taking direct aim at Trump and his administration as much as a Republican policy agenda that they say favors the rich and well-connected over ordinary Americans," the Post notes. "Republicans, meanwhile, have flitted from issue to issue seeking to promote their own candidates and disqualify Democrats," as national Republicans tried to do with O'Connor. Republican "hopes of riding last year's GOP tax cuts to victory have largely faded along with the tax bill's popularity," and the sound defeat of a GOP-championed measure to make Missouri a "right to work" state shows the GOP's anti-union rhetoric may not be a political winner this year. It is certainly possible that Republicans will find a way to turn this around. They'll "have to do something really significant in September if they want to keep the House in November," GOP pollster Frank Luntz tweeted Tuesday night. But "the polling and race ratings might be understating the Democrats' advantage," Harry Enten writes at CNN. "In other words, Democrats may actually be in slightly better shape than we think."